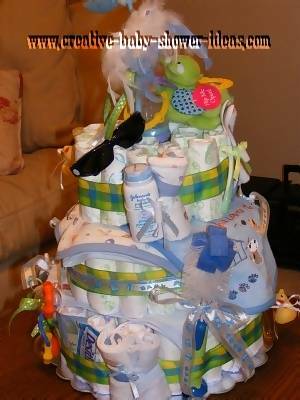 Welcome to our boy diaper cake gallery. We have lots of great photos to share with you!! If you are looking for a different category, click on the index below. Enjoy! To share your photos with us click here. 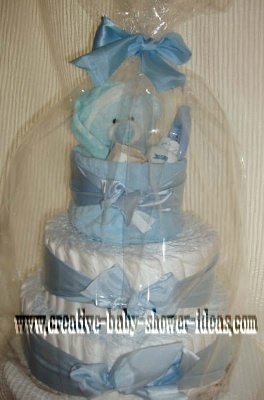 Why should you buy a diaper cake on eBay? Great Prices! Most sellers are work at home moms with little overhead. Great selection! 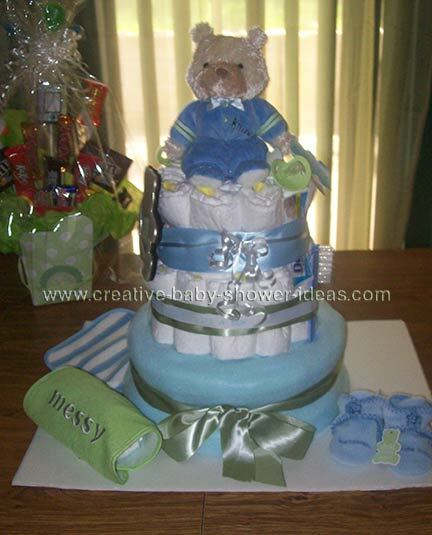 Get a professionally designed cake to match almost any theme. 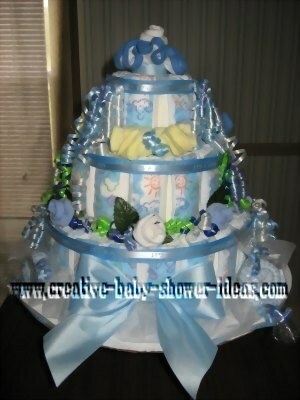 I made this one for a baby boy. 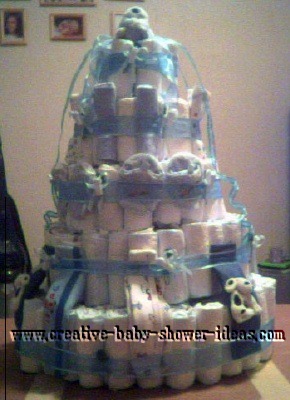 This diaper cake was an XXL. I used nearly 150 diapers to give to an unwed young mom and it brought tears to her eyes to see all the diapers, booties, mitts, socks and cloths. 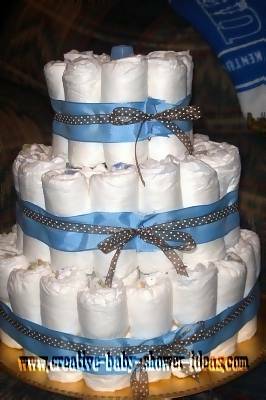 My husband's aunt made it, diapers are forming the layers of cake. 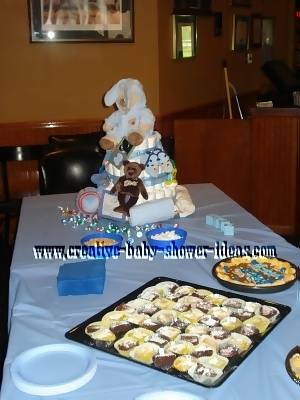 Then she decorated the cake with baby items. 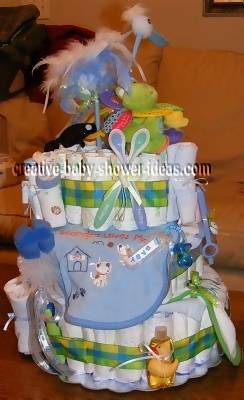 I make baby diaper cakes for co-workers, friends and family. I always get wonderful responses from the recipients. Much better than a bag of diapers. The key is HAVE FUN! This is a smaller version of the cascading boy with the baby's nickname RJ to hang in the nursery. Letters were basic wood letters from Walmart painted with acrylic craft paint in nursery colors. 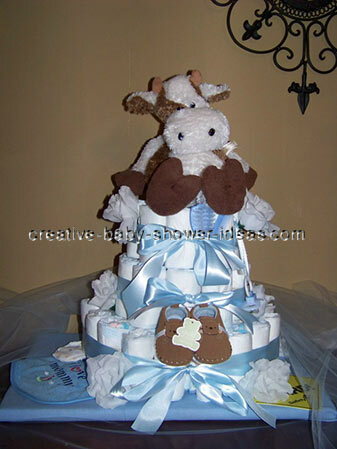 My daughter's baby shower was approaching fast and I still didn't have the exact diaper cake I was looking for. I found some that I liked certain parts of, but overall, just not what I wanted. 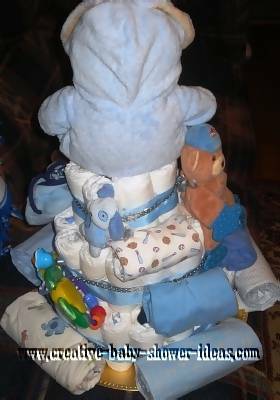 So, I followed directions on how to assembly a basic diaper cake on this site and added my own touch. I used size 1 diapers, but wish I would have used a bigger size, so she could have had it longer, before needing to use the diapers. 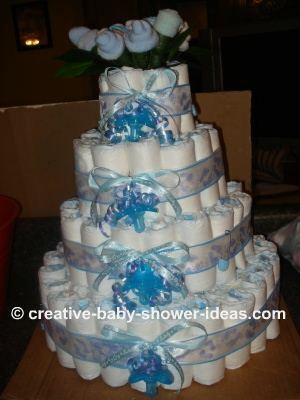 First, I covered the top half of a toilet paper roll with wide blue ribbon. 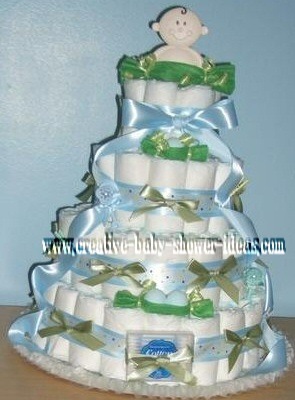 Then rolled enough diapers (decorations to outside) to cover this. I put rubber bands at the top & bottom of this circle. There should be a small amount of the top of the roll showing. Second, I secured 3 rolled diapers with rubber bands, then rolled enough diapers to go around this section & secured with rubber bands at top & bottom. 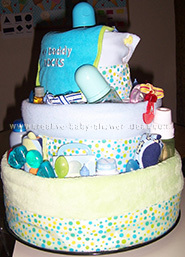 Third, I repeated the second step, and then added another ring of diapers. 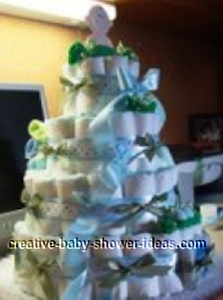 Stack the 3 tiers and insert wooden dowels through all 3 tiers to secure them from sliding around. Next I used 7/8" grosgrain ribbon to cover rubber bands. On top of the grosgrain I used double sided tape to attach It's A Boy ribbon. I used socks, hats & bibs to make roses (instructions found on your web site). 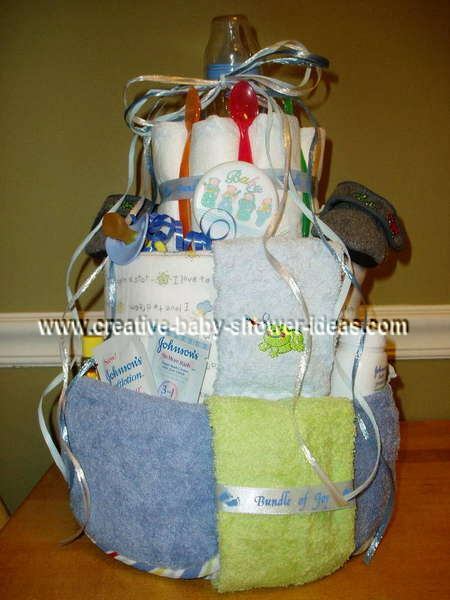 I used curly ribbon to tie washcloths & add color & decorations. I added 2 teethers, also for color. 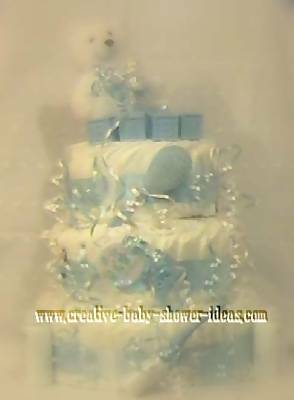 I added tulle to the bottom layer, decorated it, and then added the big blue bow. On each side of the bow a used a checked washcloth. Rolled it length wise, then curled it to look like a candy mint and added cellophane and curly ribbon. Lastly, I topped it off by putting a washcloth in the top of the toilet paper roll and a sock rose in the middle of that. Everyone loved it. Especially my daughter!! 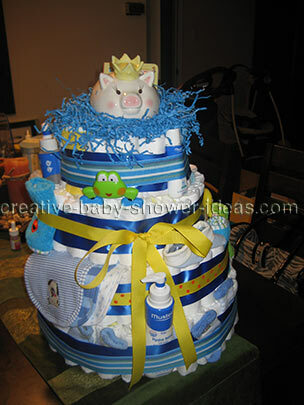 Here is a diaper cake that I did for my sister's baby shower. 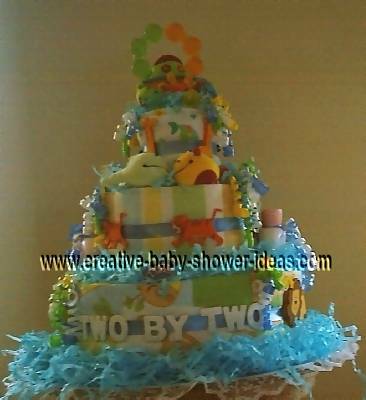 Thanks, this is a 3 tier cake I made for a friend's baby shower. 4 wash cloths-used to cover where towel and blanket ends meet when wrapping tiers. 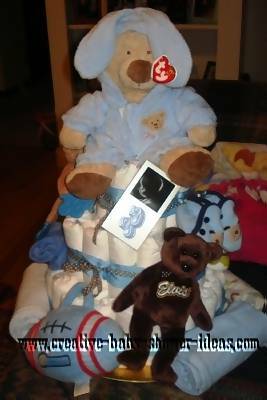 I made this diaper cake for my sisters first baby, his name is Camren and I made he and my little boy matching blue stripped blankets with blue fur on the opposite side with their nick names on them. They came out really cute! 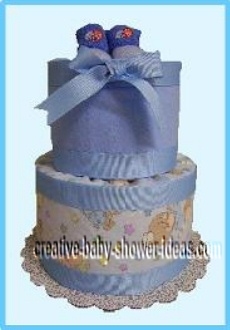 This cake has 55 diapers, 1 initial, 1 bottle, flowers and ribbon. 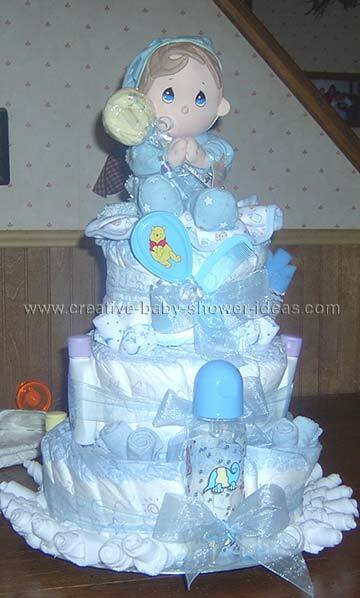 This is my first diaper cake that I did for the baby shower I was throwing for my sister. The theme was "Sweet Pea" so I tried to incorporate that into the design. I like to use diapers that have one side that are plain white. 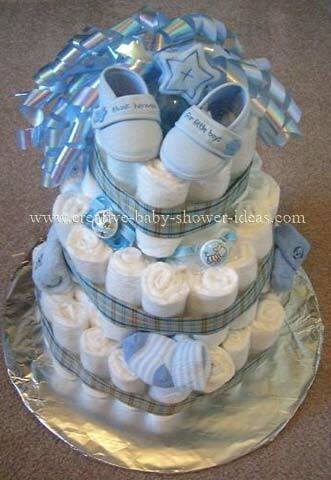 It gives you clean palette to work with, that way you can put any color on it without worrying about it matching the diapers. I bought large rubber bands and smaller rubber bands. I tied each diaper with ribbon and then secured each layer with a rubber band. It helps keep it really secure and you are able to do it by yourself this way. Layering ribbons is a great way to make your cake look more expensive. 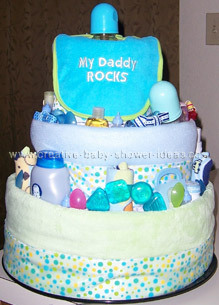 I didn't put too many "little treasures" as I had already put enough into the baby shower. Now I have started I can't stop and each experiment is a new delight. I am selling them out of a local shop and so far I think it is costing me money. LOL! I made this for my sister's baby shower, she's having a boy. The entire cake cost me $37 to make. 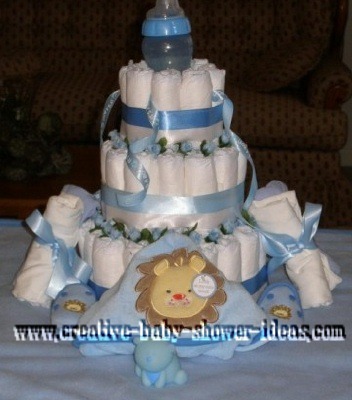 Roll diapers up and wrap rubber band around, form in large circle on platform (I used a spare piece of 12x12 floor sample, that I covered in clearance baby blue fabric)Two rows on bottom, so basically make a circle, fill with tall baby stuff them form another circle around the one you just made. Just one layer for the top two. 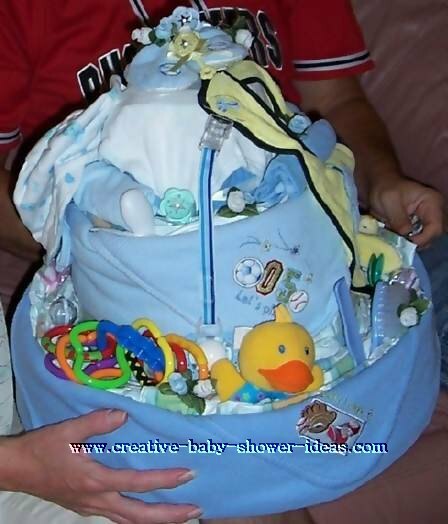 Fill circle with large baby product bottles. Tie bottom layer with ribbon. Same for second layer. 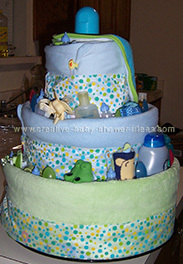 For the second layer filling, I used the pacifiers, teether ring, rattle, rectal thermometer, the hats rolled up. Once you finish the second layer you repeat for third, or possibly fourth...that's your decision and it depends on what you stuff in the middle of the 'layers' I did three layers. Then I used a bottle brush stuck down in the back part of the top layer as a brace for the cow I got. Covered it all in tulle, and tied with more of the ribbon. 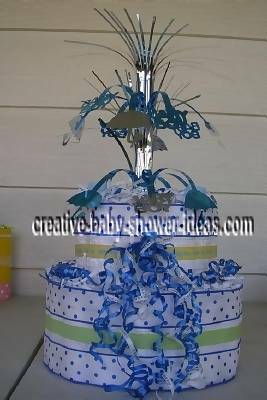 Once You finish assembling the cake, you can work on decorating the outside. 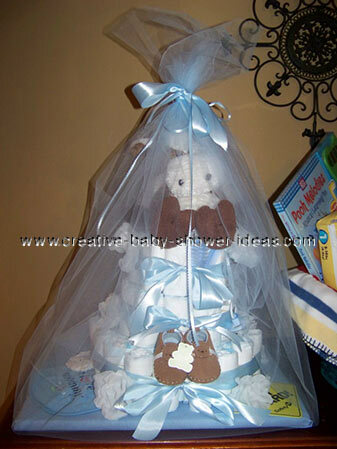 I put white artificial flowers in where the layers met, as well as plastic baby blue safety pins, pacifiers, and tucked the brush and comb set in the top layer behind the bow. I also decorated the platform with a "baby on board' sign on one side, and a " I love Mommy" bib on the other as well as tucking booties and socks all the way around the base, forming a border. It came out way better than I had hoped for, and was my first attempt! 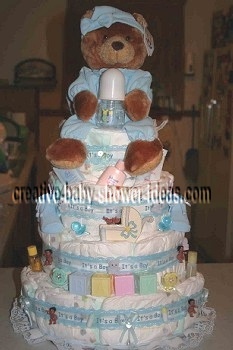 This is the 3rd Diaper Cake I have made when a friend or family is having a baby. I thought making her a cake would be more thoughtful than wrapping or bagging a present. Not only are there cute and special gifts on the outside, but there is another surprise in the inside that helps bind the cake together. Enjoy. It is a precious moments boy cake. I made this for my sister-in-law to give, after she had been to a baby shower that I gave one as a gift. This was a little difficult since I didn't know the parents. However every baby is precious, so I chose that theme. 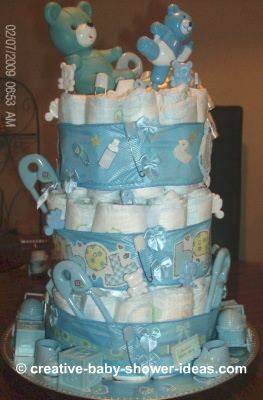 It is a three layered cake made with 72 diapers, the insides of each layer are wrapped roll style and the outside is diapers overlapped to make it look like cake icing. 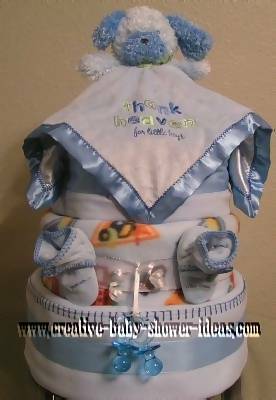 I then tied two burp clothes fan style and placed on top for the topper setting. On top of that is this cute precious moments praying doll, holding a lollipop wash cloth, the stick being a soft tipped spoon. I also placed some samples of soaps, wash clothes folded like rose buds, a bottle, and socks folded a rose buds around the bottom, placed it all on a plate for serving. She said this was the talk of the shower. 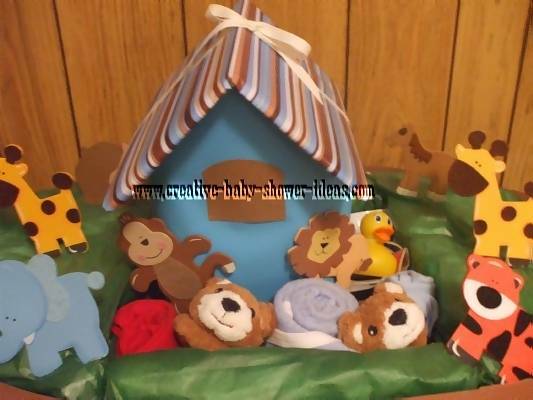 This was my first try at a diaper cake my daughters theme was Noah's Ark. This cake was made as the others were. 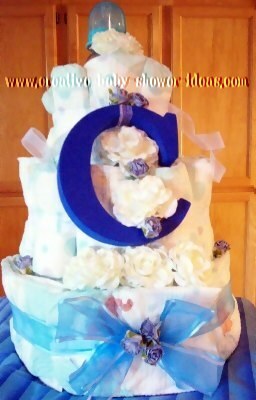 I enjoyed creating this cake with my own ideas and cannot wait to make another one. Be careful, for these cakes can be very addicting. 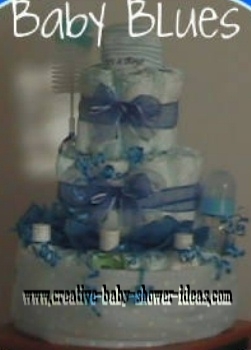 My first diaper cake I made for my Sister n Law when I hosted her Baby shower! My theme for it was Blue and Brown to go along with her color scheme! I had a lot of fun making it and will be making another one for my best friend who is having a girl! 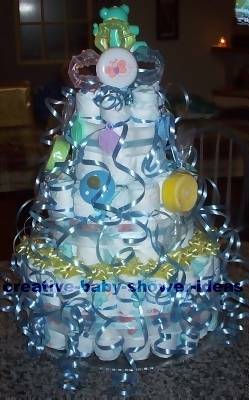 I made a 4 tier diaper cake, with one big bottle on the bottom full of jelly beans for the surprise later. I held the top to tiers together with another big bottle without the lid to hold the roses. I wrapped each row with "it's a boy" ribbon. hot glued it to stay, placed some curling ribbon through the hole of the pacifier and tied it to the "its a boy Ribbon" curled the ribbon and kind of wrapped it around, added a bow made from more blue ribbon. It says "lullaby" on it. I randomly placed 4 blue diaper pins on each row. I added the roses to the top of the bottle and stuck in some green leaves. I made sock and washcloth roses, I believe 13 fit in the top. They are all blue or white. It was easy and very simple design. 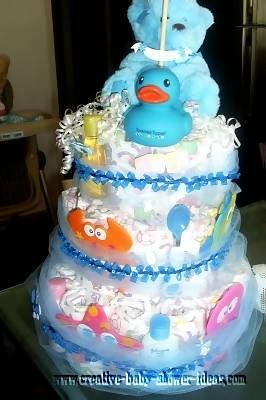 My 3rd diaper cake for my sister-in-law. 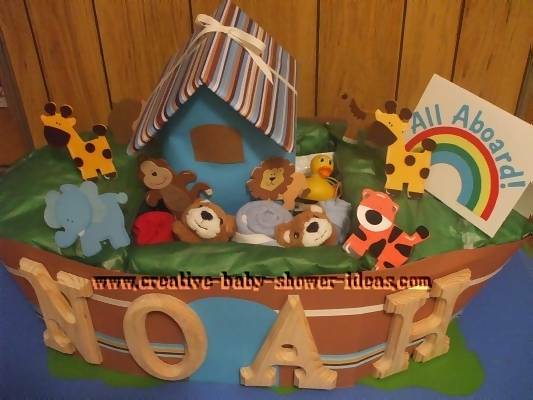 Her baby's name is Noah and she has a Noah's Ark nursery. 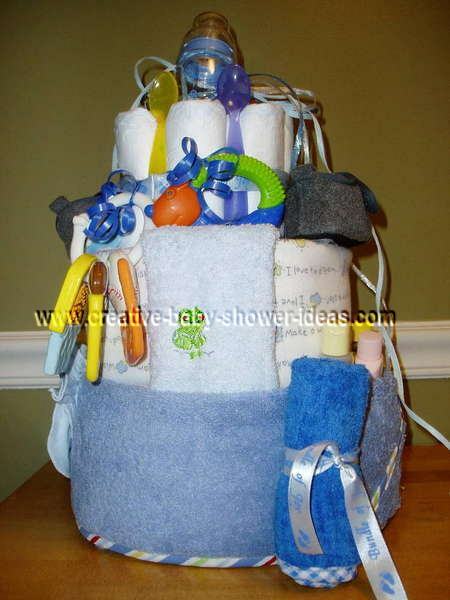 Here is the diaper ark: Filled full of baby items. Many decorations for nursery: animals and wooden letters. Had a blast making this one. I think it's my best yet! I really had to think outside the box on this one. Approx. 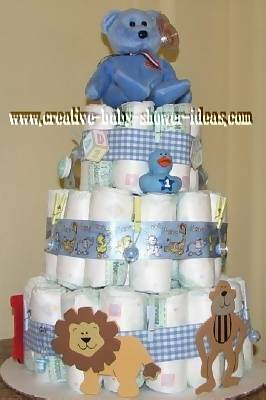 220 diapers.